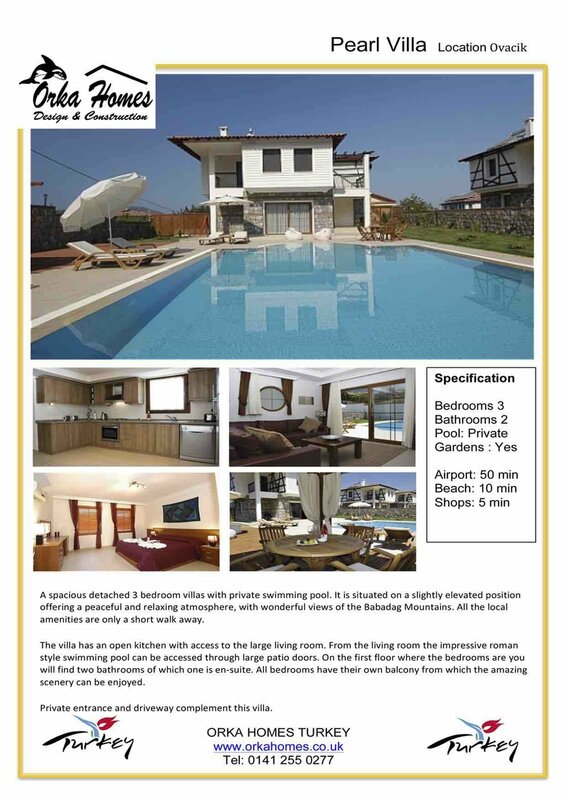 Large 3 double bedroom Ovacik property sale with a private swimming pool, gardens and driveway. Just off Ovacik’s top road you will find this lovely villa with 3 large double bedrooms ( 1 en-suite), family bathroom and downstairs W/C, fully fitted kitchen and open plan living with lounge overlooking the swimming pool. Upstairs you will find 3 double bedrooms with the master having en-suite facilities. There is a large family bathroom on this level and terraces from each bedroom. The villa is built over 2 levels and has its own private gardens, driveway and lots of terraces and patio area for sunbathing. Just a short walk away you will find an abundance of shops, bars and restaurants and Fethiye town and Oludeniz beach is only a short 10 min bus ride away. The villa has great views towards the Babadag mountain range and privacy within it’s enclosed garden. This would a perfect villa for either residential living or for the holiday rental market. Viewing trips are recommended and available to view this property and other properties of your choice.